The colors and candies are what make this recipe extra special. We found the Neon Food Coloring by McCormick to work especially well!! 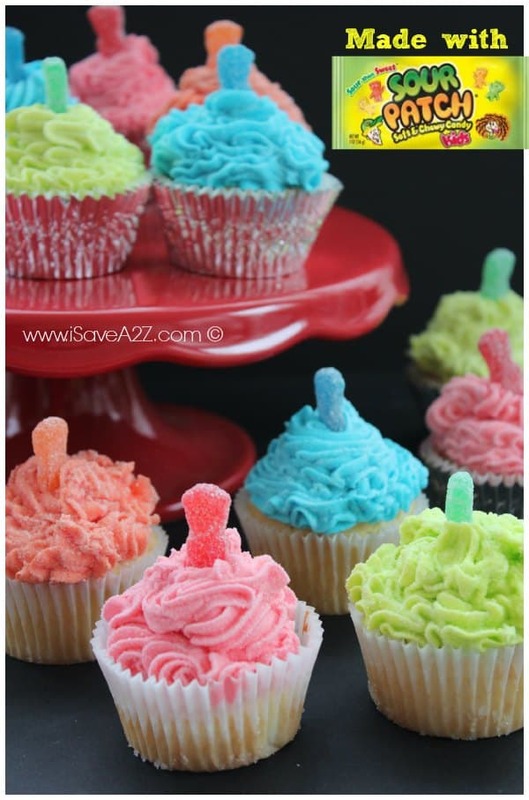 We also sprinkled the top of each cupcake with Wilton’s clear sugar sprinkles to give it the look of Sour Patch Kids! Worked perfectly! This recipe is super simple because we made it with a Pillsbury box cake mix but we added a few extra ingredients. So next time you want to make a simple box mix of cupcakes, just add an extra touch like this to make it seem like you spent hours making them! Tip: You can use a Ziploc baggie or a pipping bag to frost your cupcakes. The Ziploc baggie will give you a smooth look. I would not use the generic baggies though. They are not as strong as Ziplock and they will break. By Jennifer on January 26, 2014 Birthday Cakes, Breads, Desserts, Recipes. This is fantastic, we love sour patch in my house! I can only think of maybe one improvement by using different extract flavors or maybe even koolaid in the buttercream. Thanks for the recipe!